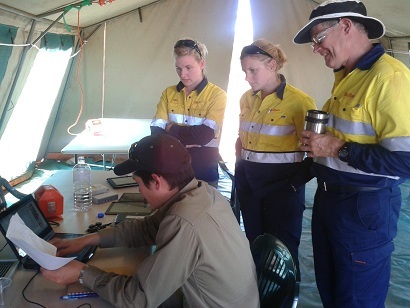 Last week AJ and I got out of the office and up into the Pilbara for a couple of days to demonstrate the Biological Data Recording System (BDRS) setup we have been working on for Rio Tinto – but this time, in the field. This was another field trip with the BDRS after the Bushblitz trip in Victoria last year. On Wednesday we finalised our packing with a short planning session. We take field work really seriously, knowing how prepared you need to be – but also to build in the capacity to be flexible. So we worked on the premise that we’d have no power, except for a 12v supply from the vehicles, and we’d have no internet or network connectivity. We needed to be self-sufficient, and run a field system that allows portable devices to synchronise with a server. So of course that meant that AJ played around in his workshop to put together a rather neat solar charging kit as well. So on Thursday, with our battery packs, chargers and inverters packed in a single Pelican we met at the Perth Airport (as it opened at 4:00am) to fly up to the Pilbara. After a cold and dark start to the day, we arrived to a crisp, sunny morning in Newman, met up with the Rio Tinto crew there and drove up to the Angelo River “camp”… complete with 24/7 power, air conditioned ‘van rooms’, an internet connection and one of the best cooks (as well as camp managers) I’ve met in these sorts of camps – great work, Bernie! AJ went to work setting up a field server for the BDRS off his laptop in the Rec tent. By adding a wireless router to our kit, within minutes we had a BDRS field server setup, linked to the two Samsung tablets we had via wireless networking. We even put the solar panel out to charge the (now redundant) battery setups. We ran two sessions to split the Rio staff into small groups of five or so people; this meant we could really work through some of the data collection methods with the people who actually do the work. As part of that, we asked them what they usually did to prepare, to provide a field sheet, and to work with us to set up their survey methodology via the form builder in the BDRS. In most cases, that took about 10 minutes. During this, we hit a slight technical hitch that meant we had to spend a bit of time reloading the WA Plant Census taxonomy to the devices (all 28,000 species names) – that took longer than the setup! Once we had loaded the different methodologies to the devices, off we went. We ran a quadrat style survey with the first group, and a point based survey with the second. 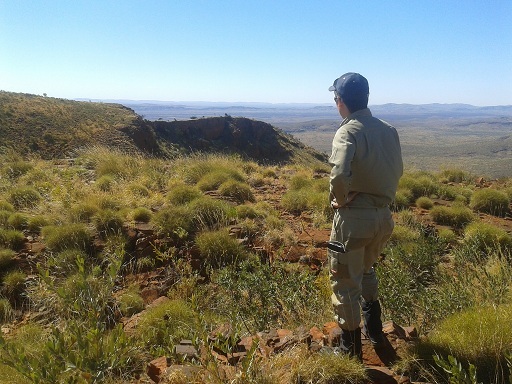 In the second one, I passed a 10” Samsung tablet to Emil Thoma, a well-known botanist in the Pilbara, and within a minute he was walking along recording species names, GPS locations and striding off into the distance. 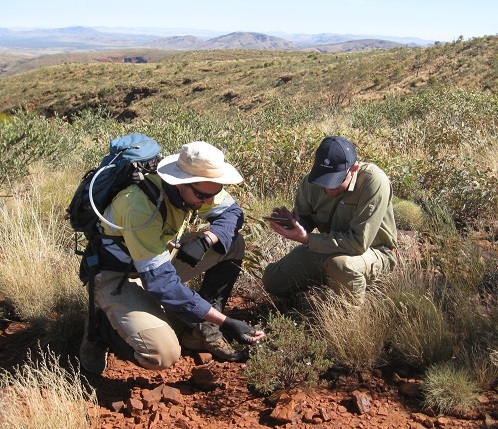 Emil actually found a Priority 3 species during our demonstration, and took the time to explain a few species to me – my Pilbara plant skills are very, very rusty! After a bit of a hike, we walked back to the Rec tent, synchronised the records, and went off for dinner (by then, the smells wafting from the mess van were too good to refuse). After dinner, AJ showed Emil and others the records that we took during the testing on the field server laptop (if we’d brought a HDMI cable, we could have shown it on the plasma screen in the Rec tent, too). We also discussed being able to do things like automate the production of species lists, reports and all sorts of other outputs, as well. On Friday, we had a second trial – at the highest point in Western Australia, Mount Meharry (named, according to Wikipedia, after the Chief Geodetic Surveyor from 1959 to 1967, William Thomas Meharry). In a somewhat surreal experience, while we were there someone’s phone rang – we got a 3G signal from the local minesite (probably West Angelas), so AJ and I sent off a Tweet or two from there as well (mine was conveniently geolocated, as well as having a picture of the survey mark). We wandered around the “summit”, again with the Galaxy devices in tow, recording as many plant species as we could in the area, including a Declared Rare plant. We recorded over 100 species around the summit, and when we got back to the office were able to synchronise the data with the server, and produce a list of records to send back up to the Rio Tinto crew. Of course during the trip I also recorded as many birds as I could identify on my mobile phone. I found it quite challenging to be birding in the Pilbara again – something I haven’t done in a while. It was especially frustrating to almost know the calls… but not quite. So my records are mainly the large, easily identifiable birds like birds of prey and the like. I was disappointed I didn’t end up finding any Spinifex Pigeons, one of my favourite birds of all time. But still, I pulled in 100 or so records from the two days – and along the way I cracked 10,000 records in the BDRS from my own bird surveys. Along the way we had some good results from using the BDRS, and the Galaxy tablets in particular. We’ve struggled for some time to find a good tablet for use in the field. In the past we’ve hired out rugged units, but at ten times the purchase cost of non-rugged devices, it’s getting harder and harder to justify the cost of these rugged units. So this time, we took two non-rugged tablets, the 10” and 7” Samsung tablets, unprotected, and they seemed to work fine. There are still some things we’d like to look at in terms of these units and how they work, but I personally am coming to the conclusion that you’re better off with a cheap unit, protected where you can with cases, and run with it until they break – then get a new one. I’d be surprised if you go through ten in two years… which is the longest lifespan we’ve got from a rugged unit. A couple of weeks ago, we had Linda in the office testing and using the BDRS in an urban situation; doing tree mapping around our office. For someone that had no experience with this sort of work, I was very pleased to see what she could produce in just two weeks. 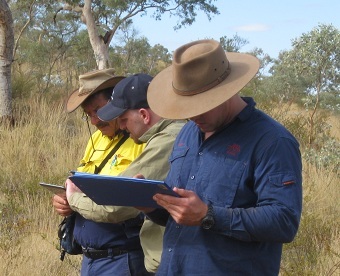 And now, with this trip (and the previous Bushblitz one), we’ve explored the other end of what is capable with the BDRS software – a wide range of professional surveys in the field. This really bodes well for the software as we further develop and move the software forward after the Atlas of Living Australia funding that started this journey for us. 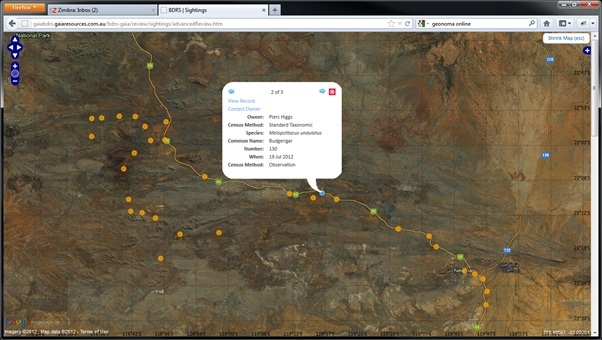 The results of the demonstration in the Pilbara were really positive. We’ll be moving on to the next phase with Rio Tinto in the future of moving the BDRS out into operational use with their internal botanical and fauna teams, and I’m hoping that this means I can get out in the field again – and I’m already scheduled to be out in the field in October with Rio Tinto leading a birdwatch event around Karratha – so I better get those bird calls sorted! Contact me via email or Twitter.